The Hindu Munnani protesters gathered on Feb. 18, 2018 in Erode District, Tamil Nadu. Submitted photo. A year ago on Feb. 18, about 80 Christians shuffled into Almighty God Church inside their pastor G. Pughal’s house in Kodumudi, Erode District, Tamil Nadu, India, for Sunday prayers. Men in simple collared shirts and trousers and women wrapped in purple, red and blue cotton floral saris, with fragrant jasmine flowers tucked into their braids, held squirmy children on their laps. The door of Pastor G. Pughal’s house church before the congregation shifted to another house in the same district. Submitted photo. The families prayed in Tamil, a South Indian language, their voices competing with the approaching chants outside and a spinning ceiling fan, until a group of 15-20 Hindu fundamentalists – some just teenagers – threw open the blue metal door and shouted at the pastor standing at the pulpit. In the tone of a police officer investigating a drug pin, they demanded written proof of the local government’s approval, which Pughal did not have, he said. The independent ministry had been hosting prayer meetings for 17 years. The media has widely reported a 28 percent rise in religious and often violent hate crimes in India by Hindu extremist groups since Prime Minister Narendra Modi’s Hindu nationalist Bharatiya Janata Party (BJP) won national election in 2014 to 2017, though some dispute whether the reports have merely corresponded with a rise in digital media outlets and interest in that topic, particularly violence against Muslims. But even with reports on bloodshed (like this one of 25 violent attacks just over the Christmas holiday), persecution of Indian Christians has largely remained in fringe Christian media. Only 2.3 percent of the country is Christian, according to a 2011 census—that equates to 28 million people in the world’s largest democracy. Religion Unplugged spoke to 26 pastors, laypeople, lawyers and activists from five states who say that though violent threats to their religious freedoms are the norm, Hindu fundamentalist groups have shifted their strategy from violence to a more coordinated effort to use building regulation laws to shut down churches, especially in remote areas. Inside the A.G. Prayer House in Erode District, Tamil Nadu during a Christmas celebration. Submitted photo. Although the right to assemble is a fundamental right, the right to conduct a religious service is not. Neighbors have the right to complain to police about religious services conducted in a residential building, though Hindu family prayers in the home are norms for certain festivals, and noisy street processions and early morning calls to prayer from loudspeaker towers are common. In the first 31 days of 2019, a UCF helpline recorded 29 incidents of violence and threats toward Christians nationally compared to an average 20 incidents per month last year. Pughal called the UCF helpline and received free legal advice and a lawyer to challenge the church’s ban. A year later, the church’s case is still proceeding in the lower court. In Tamil Nadu, a 1972 building code and 1994 panchayat (local self-rule) building rules require local government approval to build a structure used for public worship or religious purposes, and approval can be denied if the government believes public peace and order will be disrupted. It’s less clear how the law should handle worshippers gathered in a home. India’s left-wing party, Congress, introduced similar laws in other states, Madhya Pradesh and Rajasthan, and in 2000, the right-wing BJP state government passed the same laws in Uttar Pradesh, the country’s most populous state. Under these laws, local governments can regulate the use of buildings by religious groups and require permissions for religious activities. The BJP regained power over the state with the 2017 election of the Hindu monk Yogi Adityanath, who promised to build a Hindu temple on the same land as the ruins of a 16 th century mosque destroyed by Hindu fundamentalists in 1992. In 2018, at least 55 churches in Uttar Pradesh, 25 in neighboring Uttarakhand, and 19 in Tamil Nadu have been closed after Hindu fundamentalists raided them or filed complaints with police, according to UCF helpline reports and Alliance Defending Freedom (ADF), a US-based non-profit that provides legal aid to defend religious freedom of Christians. Some had congregations as many as 300 people. These church counts are bare minimums, as pastors in the areas insist that there are too many and in remote places to keep accurate records. Mange Singh, from Ruhalki Kishanpur near Haridwar, has helped coordinate house churches in 85 villages across the Himalayan foothills in Uttarakhand and said the police have closed seven churches permanently. Singh’s church, Christian Revival Church, has been attacked at least 25 times by Hindu extremists groups since it began in 2010. Instead of arresting the attackers, the police usually arrest a pastor. Singh has been arrested 32 times since 2011 over conducting prayers or false allegations of forcibly converting someone to Christianity, he said. Just last month on Jan. 16, a Hindu mob harassed and beat one of Singh’s church members. In a 2018 annual report, the Indian organization Persecution Relief recorded 129 attacks against Christians in Uttar Pradesh alone, the highest number among the 29 states of India. “Since 2014, persecution has increased,” Singh said, calling the past few years “Persecution Anytime”. Rajesh Kumar, a pastor from Sultanpur in Uttar Pradesh, led a church of 300 members that met in his own house for the last 10 years until 2018, when members of the Bajrang Dal disrupted their fellowship. The Bajrang Dal is a Hindu extremist group formed in 1984, presently based in Delhi and a member of the Rashtriya Swayamsevak Sangh (RSS), a paramilitary organization that’s the ideological parent and grassroots arm of the BJP. The US’ CIA labeled the Bajrang a “militant religious organization” and the RSS a “nationalist organization” in its 2018 world factbook. “They took us to the police station and an FIR [First Information Report] was lodged against us for ‘disrupting peace,’” Bhawar Pal Singh, an elder of Kumar’s church and not related to Mange Singh, said. The church has remained shut. Nehemiah Christie, a coordinator for ADF, backed up Masih’s account with his own anecdotes from southern India. 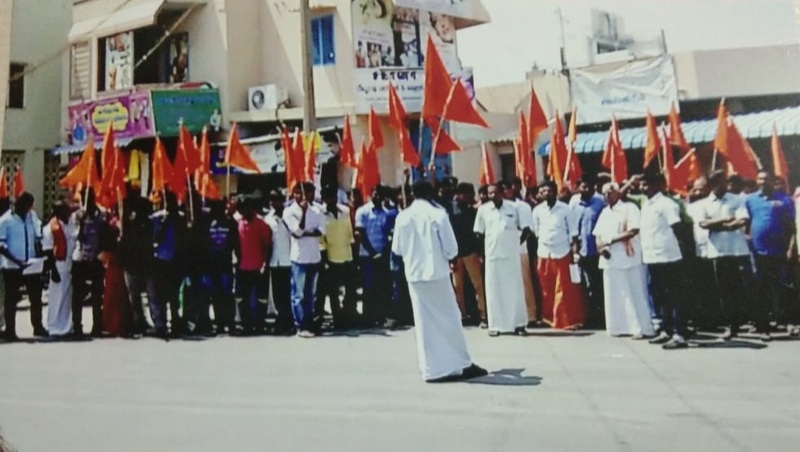 The men who barged into Pughal’s home belong to the Hindu Munnani, formed in 1980 with the stated aim to defend Hinduism and protect Hindu religious monuments. Munnani activists commonly preach that Christianity is a foreign, Western faith inappropriate for Indians and that Christian pastors are offering money to convert poor Hindus to Christianity, which is illegal. Extremists overlook or deny that Thomas, an apostle of Jesus, brought the Syrian Christian tradition to India and is believed to have been killed in Chennai, South India in 72 A.D. The rally participants that day came into town from other villages, clearly looking to a leading Munnani activist, a man named A.N. Karthik, for directions, Pughal alleged. He thinks the villagers were paid to participate. Most of the Almighty God Church congregation come from the Dalit or “untouchable” community, traditionally impoverished in Indian society and most commonly evangelized by Christian missionaries from India and abroad. By becoming Christian, a Dalit Indian can sometimes gain a more equal social status in their community, and sometimes invite more discrimination. Pughal says the families in his church flock converted to Christianity more than a generation earlier. The Indian constitution provides for freedom of conscience and “the right to freely profess, practice and propagate religion subject to public order, morality and health”, but the latter provisions substantially weaken religious freedom in practice. For example, many states enforce “anti-conversion” laws, which in some areas require a person to seek permission from their local government 30 days before converting to a new faith. Religious identities are often used on official records because there are certain laws that apply differently to different religious groups, from tax deductions to bank loans to marriages, sometimes favoring Hindu and Sikh families. 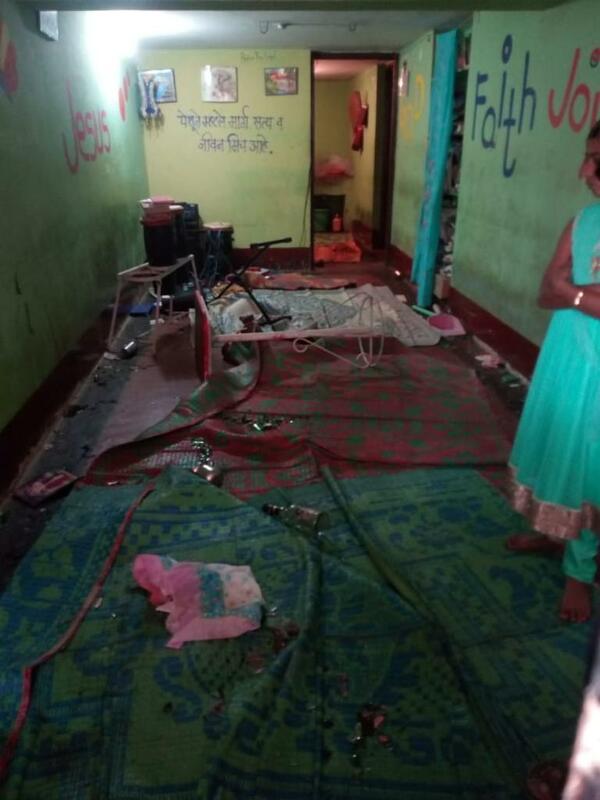 The aftermath of an attack on a house church and its congregation in Kolahpur, Maharashtra. Submitted photo. Suresh, Pughal’s lawyer, admits that the church needs permission from the district’s magistrate, but he is arguing in local hearings this month that this permission shouldn’t be denied, and the men who demanded proof of permission were trespassing onto private property. Christie, the ADF representative, said the most frustrating part is the complicity of police. In January 2018, a pastor was found dead hanging from a rope of his house church, isolated from the rest of the village in Tamil Nadu. A week earlier, the pastor had filed a complaint to local police about Hindu men who didn’t approve of his church. On Christmas Eve in Uttar Pradesh, 42 Christians in various areas were arrested for “disrupting peace” and locked in police custody until after Christmas, according to Masih, who tallied the arrests from local media reports. Even without the law providing loopholes to discriminate against religious minorities, public sentiment and media portrayal plays a big role. “Newspapers in their reports present things in a way that makes it seem like Christians are not legally permitted to meet in homes and have fellowship,” Masih, the pastor in Allahabad, Uttar Pradesh, said. “Christians are warned by villagers and in most cases by the Village-Head that, if they want to continue staying in the village, they will have to stop the Christian fellowship in their homes or else they would be either thrown out of their own homes and villages or boycotted by the entire village,” he added. Some Christian communities, like Pughal’s, continue to meet for prayers in new locations, though finding a new home took Pughal six months. The home trespassed upon was rented by a Muslim landlord, who had no qualms about their prayer meetings. As Pughal inquired for a new home to rent and host Christian prayer meetings, word spread that he’s a criminal, and landlords refused him. Now he lives in his mother’s home in the same locality. Other communities split up their churches into small groups that can meet more secretively inside homes, or they stop meeting altogether. Surendra Kumar, a pastor in Haridwar, Uttarakhand, said the closures have actually resulted in more people joining the Christian faith. In the background of shuddered house churches, the BJP has emphasized the role of grassroots social organizations that promote yoga, Ayurveda and Hinduism over foreign non-government organizations (NGOs) that work to protect human rights, religious minorities or the environment when in conflict with particular business or BJP interests. In 2016, India’s Home Ministry cancelled the foreign funding licenses of 20,000 NGOs. Many were Christian organizations. The most prominent example was when Compassion International, which runs education programs for poor children and was suspected of converting Muslims and Hindus to Christianity, was financially choked out of the country in 2017. The BJP’s family of RSS affiliates often receive funding from abroad to carry out their work, from children’s education programs to yoga retreats and mediation centers, and allegedly, shutting down Christian institutions. “There’s no repercussions from Christians because they keep quiet,” he added. Christie says his office with ADF has tried to discuss violence against Christians with Tamil Nadu Chief Minister Edappadi Palaniswami, whose party is likely to ally with the BJP for seats in the election coming this April or May. This story was co-published with Newsweek.